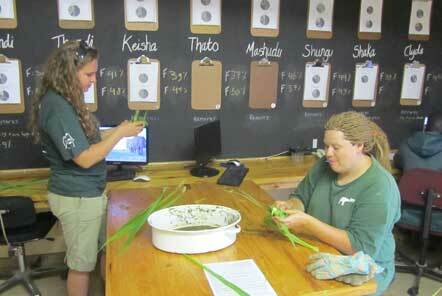 Erin from the Pod Volunteer office was lucky enough to visit the amazing projects that we work with in South Africa. 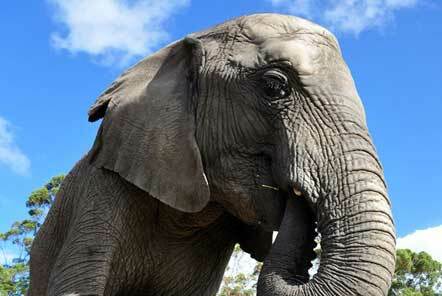 In this blog she covers her time at the Elephant Care and Research project. 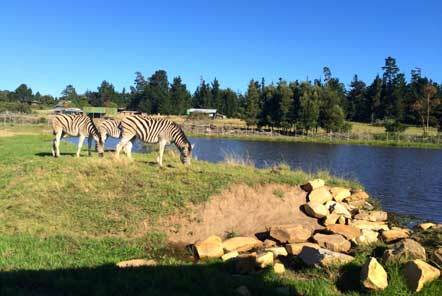 My next stop was further around the Western Cape to the Garden Route to visit the Elephant Care and Research project. Being based in this region means that the project is ideally located for volunteers’ days off activities and the volunteers at the project were planning their next weekend’s activities which included swimming with seals, whale watching and sky diving! When I arrived the volunteers were busy making enrichments which were going to be given to the elephants that night. This involved crushing pellets and mixing these with molasses and this mixture was then shaped into balls. We then took banna grass and wrapped this around the balls to create neat parcels which are a tasty treat for the elephants. It takes a while to get the technique right and ensure that the parcels stay closed and that evening when the elephants came into the boma these treats were hidden all around and some were hand-fed to the elephants. All that hard work and careful threading of banna grass to create the perfect parcel was devoured in seconds, but the elephants certainly seemed to appreciate them which is the most important thing! After dinner I spent the evening with a volunteer and we carried out some night time observations of the elephants. This involved sitting upstairs from the boma so we had a view over all of the elephants and recording each elephants’ behaviour at 5 minute intervals. The main behaviours we observed were sleeping and stealing each others’ browse (this is the branches that volunteers have collected and put in with the elephants for them to eat overnight). At 6.30am the next day I walked out with the elephants, this was one of my favourite activities from my first visit and certainly didn’t disappoint this time either. It’s a quiet time of day before any visitors are around and the scenery at the park is beautiful. After breakfast, the volunteer coordinator Jenn, some volunteers and I got a lift on the tractor to meet up with the guides and elephants out in the field to do a shift of behavioural observations. 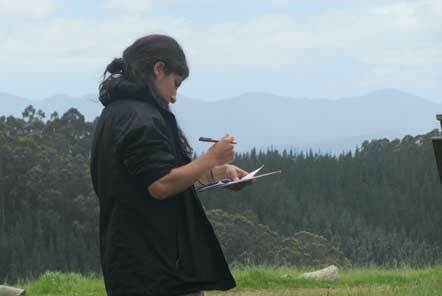 During this time, volunteers were recording feedback behaviours and social interactions between their designated elephant and the other members of the herd. Whilst in the field, I couldn’t help but be amazed to see how much Thato (a 5 year old elephant) had grown since my last visit! 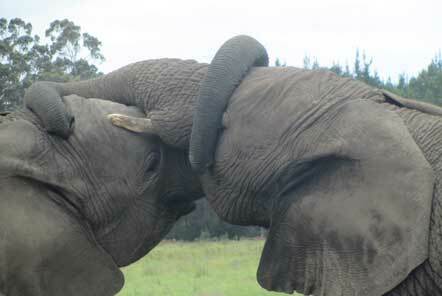 It was also great to see how the two slightly older male elephants, Shungo and Mashudu, still spent a lot of their time together and as they were getting older, they spent some of their time play fighting, just like two naughty young boys. That afternoon I spent time with Jenn and some volunteers creating enrichments for Shaka and Clyde who are two large male elephants. The project had been given some metal beer kegs as a donation from a brewery. The kegs had been washed out and had holes drilled into the sides of them. We filled these with pellets and carrots and gave them to the two elephants to see if they could work out how to get to the treats inside. 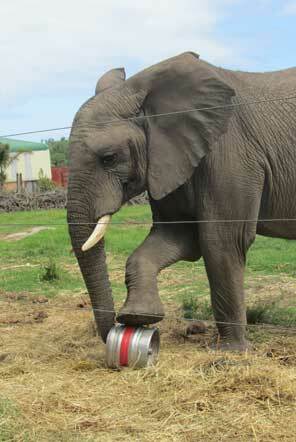 It was fascinating watching them as this was the first time the kegs had been used for enrichment. They had been very intrigued watching us carry the kegs towards them and started sniffing them as soon as they were put in. Poor Shaka wasn’t really getting the hang of it as he kept rolling the keg length ways rather that sideways (which is where the holes are and would allow the pellets and carrots to drop out when rolled in the correct direction). Clyde got the hang of it straight away, after sniffing out the pellets he then began rolling the keg effortlessly with his foot whilst at the same time picking up the pellets and carrots that fell out through the holes with his trunk. Later the volunteers and I provided the rest of the elephants with some additional enrichment which was in the form of tyres which had been filled with pellets and hay, we gave these to the elephants; it’s always an amazing feeling having the elephants gently take something out of your hand with their trunk.